A Princess’ duty is never finished! While the Nintendo Switch is starting to see the release of more and more new games for the platform, ports and re-releases of older games are still coming and too their credit, some of the older games do feel at home on the Nintendo Switch, are selling well and give Nintendo only gamers, the chance to play something that’s new to them, even though the game is more than four years old. One such old game that is set to grace the Nintendo Switch this July, is none other than Code of Princess EX. Previously published by the likes of Agatsuma Entertainment, Atlus USA, Degica, the Studio Saizensen developed game is now being published by Nicalis, and joins the company’s ever-growing line-up of new and old games that have had the chance to grace the Nintendo Switch with their presence. First released as just Code of Princess, for the Nintendo 3DS in 2012 in Japan and North America, the game was not met with overwhelming success, as its reception was not the warmest in the world, but visually, Code of Princess EX, is not completely the same game it once was. The established art style still remains, but the art styles themselves have been improved for a sharper look, more noticeable details and nicer looking enemy health bars. On top of the “all-new high definition visuals,” local multiplayer has been added as well, so that two players can play together to complete the main campaign and tackle the Bonus Quests as a team. There’s also been some balancing done for the gameplay, and improvements made to the AI. So for gamers who played the previous 3DS and/or PC versions, there is a substantial change from this version and the regular one. 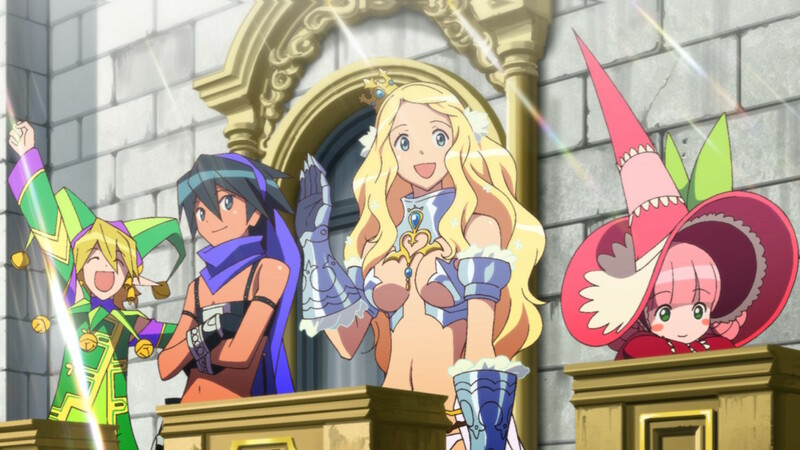 Now, with regards to just what kind of a game Code of Princess EX is, in the first place, it is an action RPG that casts one Solange Blanchefleur de Lux, Princess of DeLuxia, as its leading lady. There are of course other characters, such as Ali and Zozo who play an important role, but Solange is the one true hero. A hero whose story just so happens to see her attempting to save the world, after having to flee her Kingdom after monsters attack. All whilst wielding the sacred blade DeLuxcalibur. Only this role-playing game, relies on hack and slash gameplay, as opposed to strategy, resulting in the action feeling more like a 2D beat ‘em up game. But, to its credit, there are your typical RPG elements still at play, as Code of Princess EX does have an EXP system that will allow characters to level up and there are plenty of weapons and armour that can be purchased to raise and decrease stats. Failure to take note of your loadout can result in an immediate failure on a tougher level/Bonus Quest, so if you’re expecting to do battle against the undead, then you’ll want to make sure you have a character already geared up to battle them, or simply alter your main character’s loadout. As for how to get new weapons and items, while some can be earned by completing levels, there is a shop that will be unlocked as you advance through the main campaign. With the shop that is only every accessible when gearing up for the next level, players can spend their hard-earned gold coins that they got from completing levels and enemies that will randomly drop a chest of gold when they die. Unlike most shops in RPGs though, the items that are available will vary, so if you don’t buy something immediately, it could be a while before you get another chance to pick it up. Moving on to gameplay for a moment, for the players who are new to Code of Princess and Code of Princess EX, there is a tutorial where the basics can be learned. Among the basics, is basic attacks, which is exactly what you would expect, with button controls along the lines of Y to hit and target a specific enemy, whom you will then deal more damage to when you hit them. There’s also B and A for Weak and Strong Attacks, which can be pressed multiple times in combination with directional inputs for Special and Chain Attacks. Then there is guarding buying using the L and R buttons and whilst guarding, if you push upward or downward, your preferred character will then change actions lanes, as part of an evasive manoeuvre. As for X, this is where the real fun begins. X allows players to activate a burst mode. Burst mode is a limited time event that will permit the player to deal even more damage and will last as long as you have MP. It will drain everything you have, but once over, your MP will be completely replenished and can be replenished naturally by attacking enemies. The only bad news about bursting, is the fact that you can only use it three times per each battle, unless you have made use of the right kind of equipment that will increase the number of times you can burst. Lastly, there are also event controls. These can be taken advantage of when viewing the game’s many, many cut-scenes and dialogue. By holding R you can fast forward to get straight to the action, whereas L can be used to give players a better look at what is going on on-screen, by hiding the dialogue for as long as you’re holding L.
Now that we’ve got all of that out of the way, it is time to move on to content. On top of Achievements, there are three main aspects to Code of Princess EX and they are Single Player, Multiplayer and Internet Play. Both Single and Multiplayer Play have exactly the same content, only with one main mode, you’re playing by yourself, whereas the other you can play with a friend. As for what that content is, there is a Campaign mode, which is the main story obviously and is a must play as advancing through it is a great way of levelling up characters, as it will only ever let you control one character per level, but with a total of 8 obtainable party members, everyone can reap the EXP rewards that comes from beating levels. It is also this mode that will allow you to unlock plenty of new characters as more than 50 are playable. It is nowhere as large as RPG fans would hope for though, as the entire thing can be beaten within 6 hours, which includes grinding. You can also gain access to replayable levels for Free Play mode, which is very similar to Campaign mode, except only the character you choose to play as will gain EXP, but you can choose from any character you happen to have obtained and you can play them in a different skin colour. Campaign mode also allows players to unlock Bonus Quests. Unlike the quests you will experience from the Campaign mode, the quests in Bonus Quest, have no real bearing on the story, but is a great way of filling the game with a lot more content so players can have more hurdles to overcome. Also, for what it is worth, like with Free Play, players are free to play as any character they wish and in any available skin colour. Lastly, there is Internet Play. With this function, players can take part in co-op gameplay that supports up to 4 players and they can even do co-op quest sets as well. If you’d rather stand on your own though, there are various Versus modes in the form of Ranked Play (compete for the highest ranking,) Free Play (do battle with support for 2-4 players) and Ultimate (use your custom characters against those brave enough to fight you online.) There’s also a leaderboards to keep track of your and everyone else’s rankings. Long story short, it is 6 years later on since the initial release and Solange has still yet to put on an appropriate attire. In all seriousness, thanks to the polish and care applied to Code of Princess EX, by Nicalis, the game has never looked and played better and at long last, it is playable on a platform where it can be truly be appreciated. Code of Princess EX’s 2D hack and slash nature, might not be able to stand its ground against the likes of the numerous 3D hack and slash games currently available on Switch, but the truth is, Code of Princess EX is something of a swell title to play. It can be enjoyed in short or long sessions and above all, it is a nifty way to get players hooked on Blade Strangers, which is Nicalis’ next release and out next month. Featuring fighters such as Ali and Solange from Code of Princess EX, there is no better way to develop an appreciation for them, than playing the game that first gave us them in the first place!